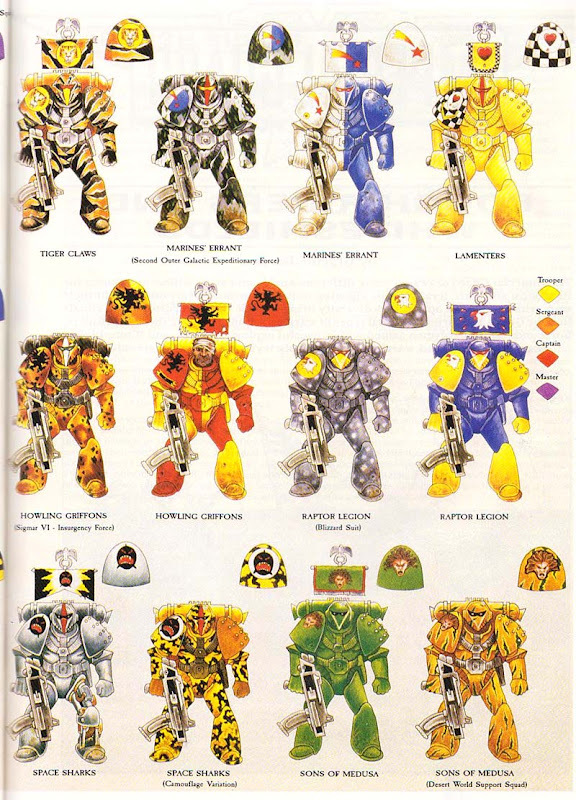 Way back when, it used to be ok for Space Marines to wear camouflage. Some chapters used it extensively while others shunned it all together as a sign of cowardice. Nowadays, the only Marines you see wearing any kind of camo are Scouts and even then, it's a cloak at best. Even they are sporting the chapter colors on their armour. Don't get me wrong, there are some folks out there doing amazing camo work on marine scouts and the Imperial Guard guys have it down to a science. But camouflage has all but disappeared from Space Marine forces. You just don't see it anymore. A few weeks ago, I got an email from a reader asking about painting camo patterns on marines. Power armoured marines... not just Scouts. In particular, the Howling Griffons in their Sigmar VI Insurgency Force pattern. I'd done a Howling Griffons terminator before, but he wasn't sporting any camo, just the regular chapter colors. This project gave me the chance to revisit the army and try something new. 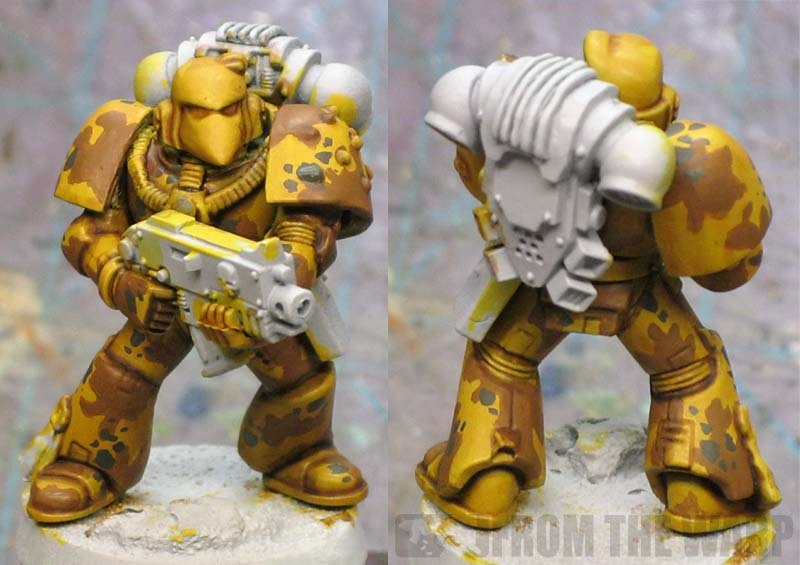 Like I mentioned earlier, a reader emailed me a few weeks ago and asked how he might go about painting this particular camo pattern on his guys. 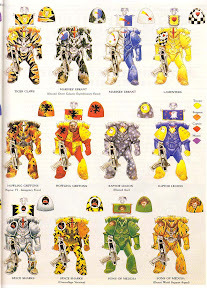 The pattern comes from the old Warhammer 40,000 Compendium. There is a single page story about the Badab War followed by a two page spread of Space Marine color schemes from the war. Lots of camo patterns in there too. Eleven of the 24 color schemes are some form of camo. You'd never see that today. 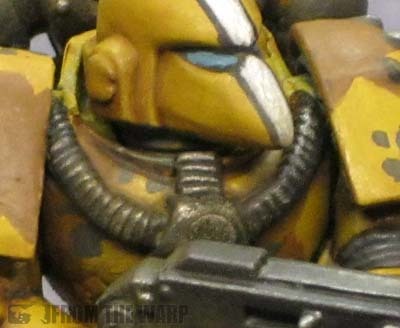 The image there is from GW and you can see some of the crazy camo patterns a few chapters were sporting during the Badab war. So with his request, we talked about painting camo and I decided to see what I could do to replicate this particular pattern. I set out to build myself a marine in MK6 armour with a few adjustments to better represent that particular mark of armour and give him an "old school" feel. Once I had him built, I set him on an appropriate desert themed base from Secret Weapon minis. Does me no good to paint him a certain way to match his environment and then not put him in it. Completely assembled, he got a quick prime with a light grey color. Since I've never painted yellow before, I knew I wanted a light color primer so I didn't have to do a thousands layers to get a good, consistent yellow basecoat on him. It took two thin coats of GW Foundation Iyaden Darksun to get a yellow I was comfortable working with. 3. Clean up original base color before adding camo pattern. After a quick overall wash with GW Gryphonne Sepia to tone him down and then some touch-up work with the base color, I set out to paint the camo pattern on him. I've never been that good at camo myself so I knew this one was going to give me some trouble. I was worried my camo might make parts of the model tough to read visually. I knew my weathering would mute it slightly in the end, but I still needed to make sure the guy looked like a marine and not just a blob of colors. To that end I decided to lighten my camo up overall. Not the huge swings in contrast to the pattern. 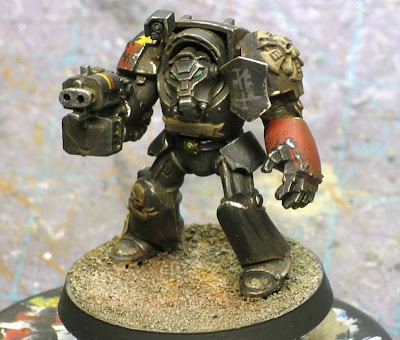 I'd save the darkest darks for defining the armour plates on the model itself. I sort of skipped on the highlighting as well.The only thing I did do to highlight was go over my model with the basecolor again after shading it with the Gryphonne Sepia wash and picked out the upper portions of the armour. 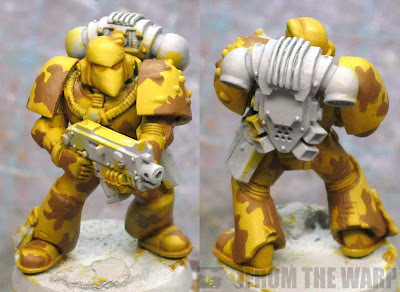 The first part of painting the camo was to block out the dark areas over the yellow basecolor. I wanted to get a good balance of light and dark. I used GW Foundation Calthan Brown to block the pattern in. It took a couple passes to get a nice, smooth brown with any variation. You want to make sure your camo is "clean" at this point since any variation in the pattern (how it's painted, splotchy or streaky for example) will read as surface texture that you don't want. Get a nice smooth finish and you can go back later and add the detail to the surface where you want it. After that dried, I went through with GW Devlan Mud and dark lined the recessed areas of the model. This helped bring back out the different edges of the armour plates. Since the picture had the browns a little warmer in color than what I had on the model at this point, I had to make a decision. Do I keep in line with the art or do I go for something that is close... keeping in mind I might need to replicate this on two or three tactical squads. Every little step I add on my test model adds considerable time as I expand that out into an army. I went with close enough at this point and hoped to minimize the time it took to transfer this pattern army wide. We still have the smaller dark spots to add to the pattern! The smaller spots were done with GW Foundation Charadon Granite. I made sure not to go overboard with these and tried placing a few clusters here and there in prominent areas only. With those in place, my "camo" was done for all intensive purposes. That meant one more simple wash over the entire model with GW Ogryn Flesh to bring the light and dark areas together just a bit more and read as one. From here on out, I went through and finished off the smaller details on the model like his gun, eyes, purity seals, etc. With all of that work done, I was ready to jump into the weathering. I did do one last thing before getting into the weathering though and that was to freehand the chapter symbol on his right shoulderpad. Here's where he really comes to life if you ask me. Through the use of weathering powders, he looks like he's been operating in the desert. The dust has collected in his armour and the subtle changes you get from the powders helps give him that battle worn look. The powders muted the camo pattern even more around the lower portions of his legs and his backpack and gun show the effect nicely as well. 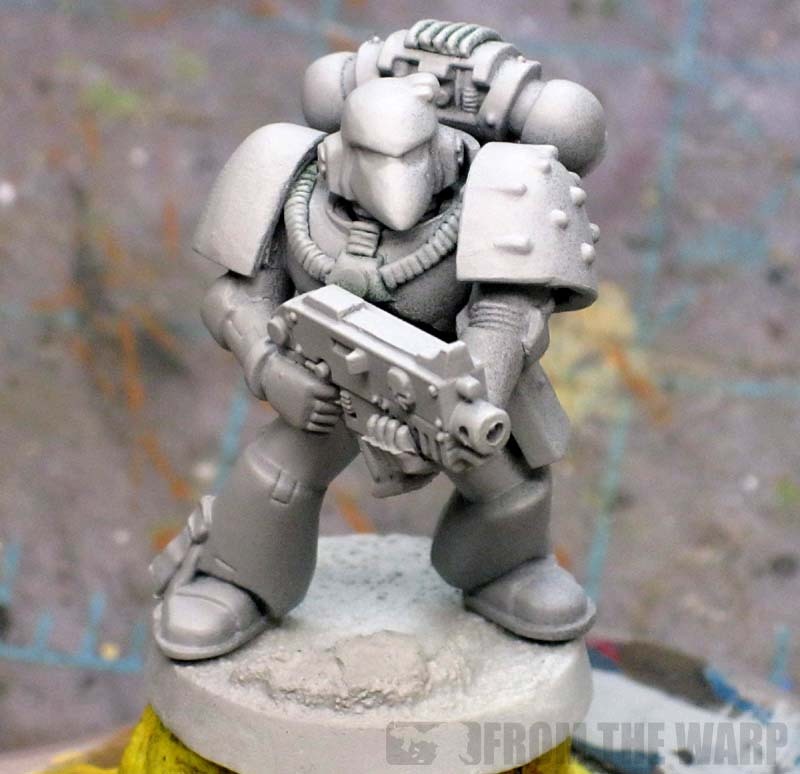 My favorite is the grip on his bolter. The dust from his hands has collected there. So what did I learn about painting camo? 1. You need to work out your pattern and colors ahead of time. A test model would certainly be a good idea here. 2. Be aware of contrast in your camo colors. Too much and it will make it hard to understand what exactly you're looking at. You want the suggestion of camo, not necessarily the exact thing. 3. Scale is important. Once you decide how big or small your blobs, swirls, dots, whatever are going to be, stick with it. Don't make them large on the shoulderpads where you have more room and smaller on things like arms where there is less room. It will kill the consistency you need to pull this off effectively. 4. Match your camo to your environment. It doesn't have to be exact, but you want close enough that it reads as though it should be a reproduction of the environment. This is the case where you want the model and base to come together and not stand apart like we always shoot for. Going the camouflage route will definitely make your army or even just a unit stand out. It can be a good bit more work, but there are things you can do to keep it from getting out of control. And you can be sure that you'll most likely be the only one with a camo paint scheme making your force stand out from the crowd. Excellent work, always like to see the old school schemes used. Great looking mini and tips. I've never actually dabbled in normal camoflage, sticking only with tanks and power armour so far. 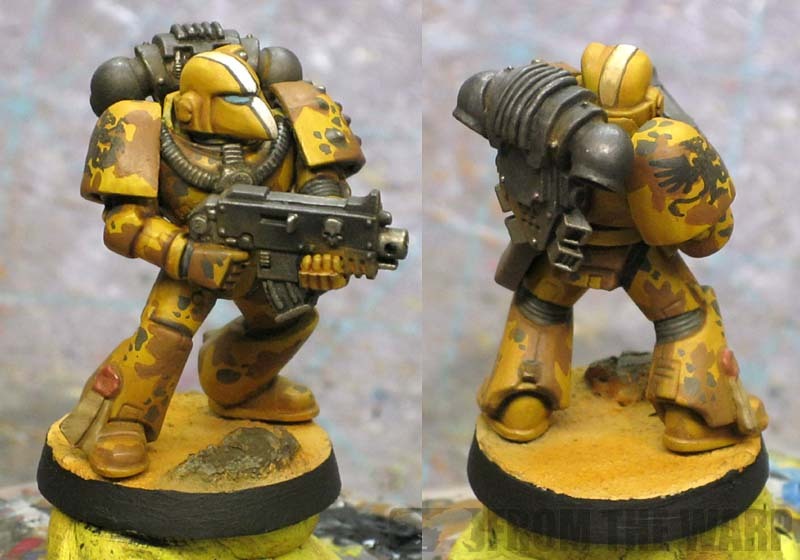 How would these tips translate to cloth camo on, say for example, a Cadian trooper? The more dynamic texture of clothing has always scared me off from trying it. This as it can indeed very quickly become a huge mess that lacks contrast. The more layers and colours already on a mini, the tougher it seems to get to blend the whole together. Still an interesting challenge I may have to try and tackle one of these days! wow I always thought of camo as ugly and dumb looking but this looks really great! Looks really good Ron. 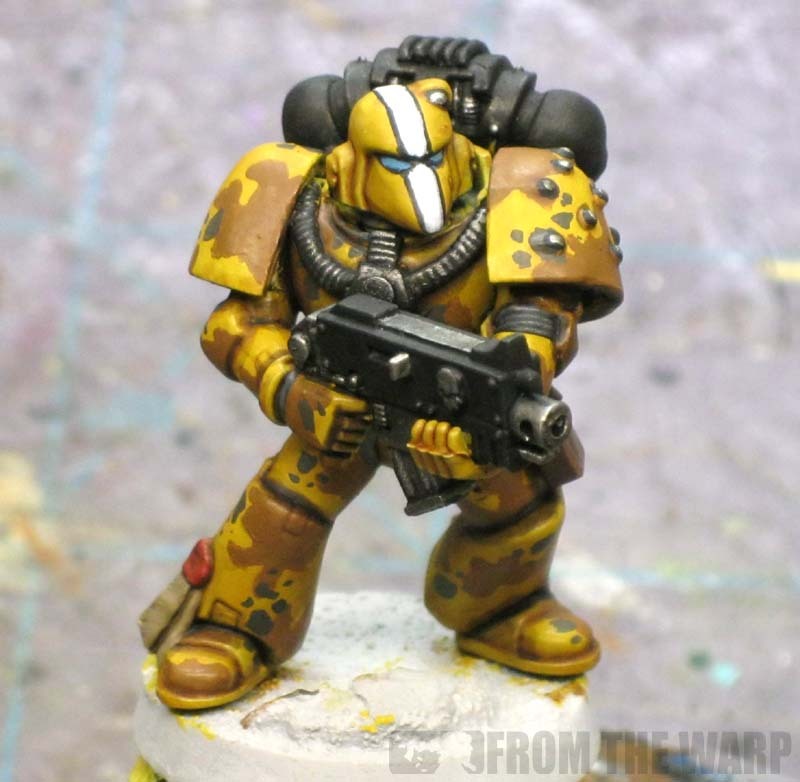 I always thought it was a shame that it became "wrong" to paint marines in camouflage. I'm hoping the "old-school" nostalgia makes up for some of my painting imperfections. People remember the good old days fondly. Warflake: That was half the fun of building this guy, capturing that RT era feel. lycanthropica: All depends on how you paint it I suppose. It can be a fine line between cool looking and over the top silly. Hephesto: That's a good question, painting cloth with its folds and such can make for some interesting patterns. Not only do you have the camo pattern, you have how the surface of the material is altering it as well. I think I'd do the same thing and only emphasize the more prominent folds on the material. Something to suggest the nature of what it's printed on and not worry about getting it 100 percent accurate. That with toning it down some might do the trick. ChicoDaSatanic: A whole force... you're a brave man indeed. Darkwing: Me too, camo just sort of died with the progression of painting throughout the ages it seems. We've focused so much on the technical aspects, we've lost the flavor in some respects. Nice execution and fantastic tutorial. This is the kind of thing that sparks people's imaginations and makes this blog rock. Kudos! This is so crazy I like it. Will see one in military greens and browns. HaWior: YOu could definitely do this in greens for a jungle look or even blue-greys for an urban look. Flekkzo: I use a very light grey that is ever so slightly off from white. It definitely makes a difference though. I don't use white because I find it hard to pick out the details on the model once it's primed. Maybe it's my eyes since I'm getting old. Iyanden covers so well that grey/white won't matter nearly as much as it does for Golden Yellow. Ended up putting GY on a gray primer and it ended up looking very dull. The white is to make the yellow pop, I would only recommend it for bright colors. 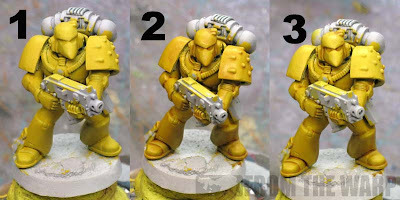 What I basically do is base coat large areas in yellow (or possibly the whole thing) which brings the details back out. Trying to pick details out to paint different colors would be a lot harder with white. If one still wants to try, using less light for the first color is an idea. Or maybe just one light source to enhance the shadows. Another way is to basecoat only the target areas white. I like going from grey to black with a thin coat of black to avoid the detail killing effect a black primer. Good stuff! I've pretty much never seen a marine done in camo, ever. Now that you've done it, camo doesn't seem that bad on marines. Awesome post, Ron! I never thought those camo schemes would look that good in real life on a Marine, but you did a great job with this. I love retro cammo on Marines/Marine Vehicles... almost as much as I love those racing stripes down the nose of a beaky helmet. Dripping with old-school goodness, Ron! Well done, sir. Flekkzo: I can see where the white helps colors that are transparent in nature. neverness: Yes, there is a bit of retro in there. Kinda cool actually. The Green Farseer: If you do it up, make sure to post it. I'd love to see how it comes out. Mr.Esty: The old-school goodness is something that's been missing for a long time in the game. Forge World is reintroducing it slowly though. Ian: Thanks for sharing the link, those are pretty cool looking models. I don't think it ever became wrong to paint space marines with camo, it was just never done well enough. Camo breaks up the outlines of an object so that it is difficult to detect, which is not quite what we want with miniatures. We want the model to visible, we want to see the details. Camo breaks this up and goes against that. HOWEVER, you've fixed this problem. You've done camo in a way that makes sense for miniatures. I commend you in that. This paint really looks awesome and you can see all the details. Great work! Tim: You make a good point. Maybe we get wrapped up in getting the pattern "correct" that we forget we are just trying to represent it enough that readers understand it for what it is and we don't have to have it perfect for the illusion to work best. 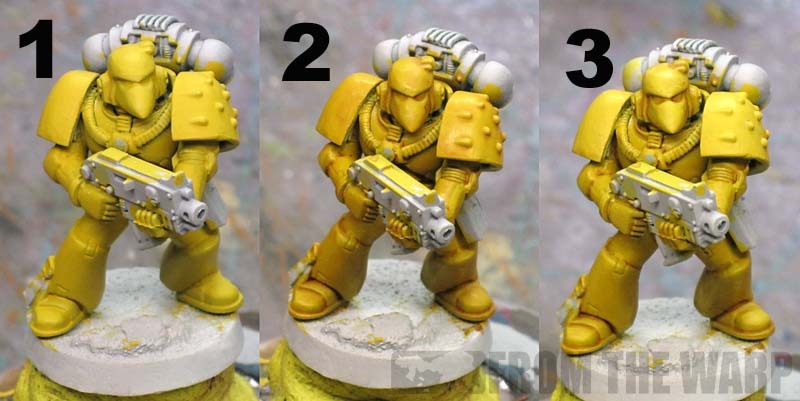 How much do you need to paint on a model? dwez: Very cool looking, thanks for the link! There is one chapter in the urrent canon that uses camouflage,The Warbringers. Read the short story 'Black Dawn' in Victories of the Space Marines from Black Library. 'The bulky armour was painted a dull green,dappled with blacks and browns to form a camouflage pattern. Only the right pauldron was not covered in the patchwork series of splotches or concealed by fabric strips of scrim.The thick plate of armour above the right shoulder of each giant bore a simple field of olive green broken by a pair of crossed swords in black.It was a symbol..... .....called the Emperor's Warbringers'. Hope this helps a few people out,considered doing a Warbringers army using an Auscam pattern,but got way too much on my plate. Troy: Very cool, thanks for the inside scoop! Has anybody tried using a stipple brush for camo? I am not great at detail and I know camo in itself is random however as random as I am it kind of looks a mess. So yeah what are thoughts on stipple brush and camo?, I have not used a camo brush but when I next get home I think I will try. Chris Bell: I have not used one. I prefer to use a fine tip brush and have much more control with my application of color. I suspect it could work with a little bit of practice to make sure you can get the results you want. I just have to say, this model looks really freaking good. Thank you! I like to think he's got a little bit of an "old school" feel to him and it sets him apart from the regular Marines we see so often.